The Bird Street Conservation area is part of a 580 acre parcel that also includes Libby Farm, and Stoughton Memorial Conservation lands and the C. W. Welch Fish & Game Preserve. Many of the trails are marked with colored markers blue, green, yellow and orange. But a few, notably the more technical ones that go over rock outcropings in the Southern section of the parcel, aren't. In all there are about 10 miles of trails to explore ranging from easy to quite technical. There are two parking areas. One at 90 Bird Street is small holding only a car or two. The one at the Bradley Lessa Memorial playground at 1258 West Street is much larger and a better entry point for the trails. I'd suggest bringing a copy of the above maps. 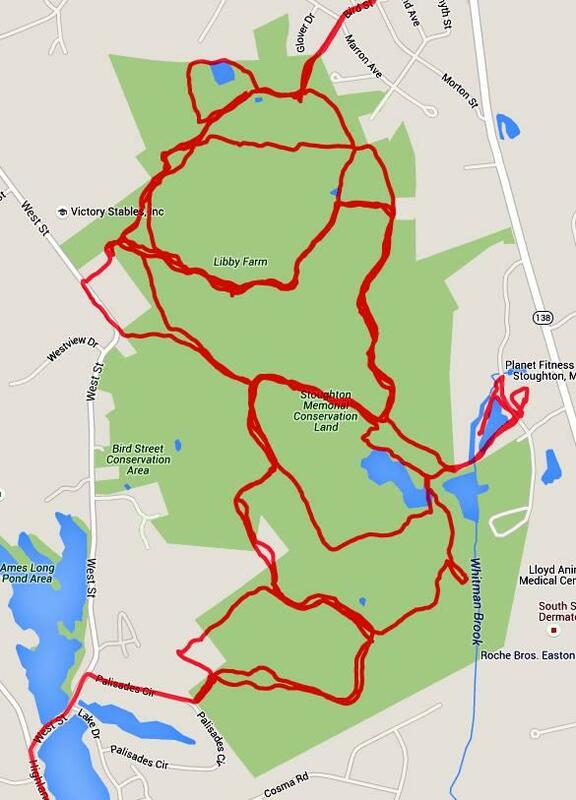 The first is a Strava route that hits most of the main trails. The trails over by Planet fitness though are probably best avoided in all but the dryest of seasons. You'll find a lot more trails than are on either of these maps. Other than locals, few people are aware of or have explored these trails. You can be among them. Be sure to read the trail descriptions at the bottom of this MAP.